When you’re hiking across a flooded plain with water halfway up to your knees, gasping for breath in the thin mountain air, it’s easy to forget how lucky you are to be doing field work in Peru. While hiking at the end of an intense workday, your thoughts drift not towards the snowy peaks around you but to the full plate and warm bed that are still many miles (and many hours) away. When, invited to a birthday dinner at a Peruvian friend’s place, you are honoured by being served the spine of a guinea pig, it’s easy to think that this wasn’t the full plate you had in mind. But, exhaustion and roasted rodents aside, most of the time, you feel extremely privileged to be researching the impact of glacier retreat on water resources in Peru. 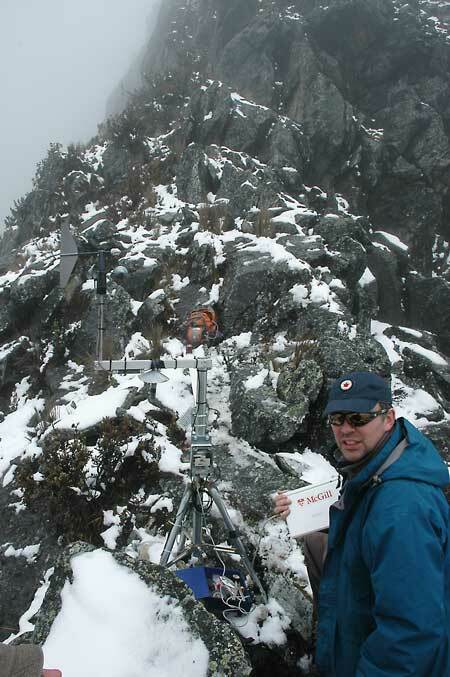 Field research in mountain hydrology occurs across a range of environments. Our work starts at the mouths of glaciers and ends up far below, where the melt water reaches the ocean. It requires an understanding how glaciers melt and how underground water reaches the surface to join the flow. It means figuring how one of these glacial systems adds up with its neighbours to form streams and rivers, and to understand how this water is used and shared downstream. Last summer, in a mission led by Bryan Mark from the Ohio State University (OSU) and Jeffrey McKenzie from McGill, we started our journey at Chimbote, one of the largest fish ports of Peru, drove up the Rio Santa – the region’s biggest river – and finished with hikes to different headwater glaciers. On our way up, we visited major dams and the intakes that supply irrigation and drinking water to the dry valleys of the Pacific coast. We saw how arid this area is and how important the water from the mountains is for both the population and the economy of the coast, with diversion projects siphoning off Rio Santa water for use in far-away centres: using new high-tech equipment mounted on a small trimaran [a multihulled boat] we measured withdrawal rates equal to about 80 per cent of the river’s dry season flow. One stop was the Huallanca hydropower plant, just downstream of the impressive Canon del Pato, where the Rio Santa’s flow is squeezed into a narrow channel by the converging Cordillera Blanca and Cordillera Negra mountain ranges. As no bridge exists at the spot, Ollie Wigmore from OSU was persuaded to swim across one of the Santa’s tributaries to pull the trimaran from the other side of the river. Well secured with a rope and a life jacket, he successfully crossed the stream after only two tries, getting a good feel for the influence of melt water on stream temperature. All along the Santa we sampled the river water. Among other things, we were interested in assessing heavy metal contamination. The Rio Santa watershed hosts a large number of mines, some abandoned. Wastes from these mines slowly release heavy metals that are dangerous for the population downstream. Elisabeth Walsh, a Master’s student in McGill’s Earth and Planetary Department, led this activity, which requires the whole team to be extremely meticulous in order to avoid sample contamination. Sampling next to tailings was quite impressive: the crimson color of what leaked from the mining debris did not exactly evoke the usual images we have of fresh mountain spring water. Having used the journey along the Santa to acclimatize to high elevation, we then started to visit the different glacierized valleys of the Cordillera Blanca where our scientific equipment has been recording key meteorological and hydrological parameters for years. At Quilcayhuanca, one of these valleys, we organised for the first time what we called the “24-hour party.” The idea was to monitor different parameters of the Cuchillacocha glacier and the proglacial lake it feeds for 24 hours to better understand the strange discharge pattern we observed at the lake outlet. Part of the work was done using an infrared camera we set up around 200 meters away from camp. As we planned to take a picture every thirty minutes to detect what area of the glacier was melting at regular intervals we organised our team of volunteers into three groups of two individuals for rotating watches of two hours. Our field work in mountain hydrology is made of this (and much more). It is pretty demnding work and if there is one thing I’ve learned it’s that it is always easier to sleep in the airplane on the way home than when we arrive. Michel Baraer is a PhD candidate in the Department of Earth & Planetary Sciences.